I want someone who listens to me. We believe in building long-term relationships with our clients and providing them with individualized financial advice. I want to feel secure in my retirement. A solid financial plan can help you maintain your wealth throughout retirement, so you can focus on enjoying your life. I want someone I can trust. As an independent financial advisor, we focus on providing unbiased advice with your best interest in mind. I want to dream big. Our services are designed to give you confidence in your financial future and help you reach your goals. 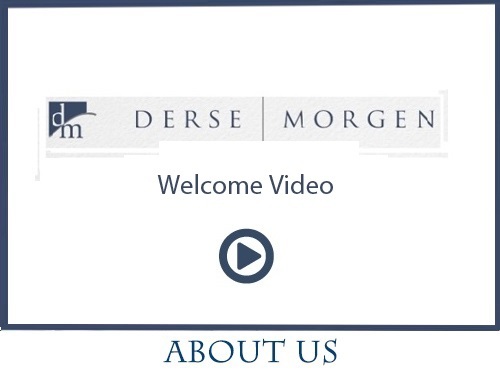 Derse | Morgen Financial Advisors is an independent financial services firm located in Lake Norman and Charlotte, NC. We advise individuals and families at all stages of life who want to simplify their financial lives and make smart decisions with their money. We also provide advice to business owners regarding retirement and succession planning, selling their business, and tax and estate planning. We look forward to learning about you and earning the opportunity to become your trusted financial partner. If you would like more information about our firm, please contact our Lake Norman Office at 704-897-0487. You can also email us at [email protected]. By choice and design, we are an independent financial services firm located in the Charlotte, NC area. Our services are provided to individuals who need the professional expertise commonly associated with large institutions, but require the responsiveness and personal attention of a "boutique" financial services firm. Please Contact Us if you are interested in more information about becoming a client of our firm. Securities and advisory services offered through Woodbury Financial Services, Inc., member FINRA/SIPC. &nbsp;Insurance offered through Derse Morgen which is not affiliated with Woodbury Financial Services, Inc. &nbsp;This communication is strictly intended for individuals residing in the states&nbsp;of AL, AZ, CA, CO, FL, MI, MN, MS, NC, NJ, NY, OH, PA, SC, TN, TX, WV, WY. &nbsp;No offers may be made or accepted from any resident outside the specific state referenced.